The Toymakers is a rare and magical piece of literature, one which I feel blessed for having discovered and read. Though I had been approved to review the title on Netgalley, I decided I ought to purchase the beautiful hardcover edition as no doubt this will be a novel read several times, particularly in the run up to Christmas, during which time much of the story is set. The novel begins with Kathy's story: she is a 16 year old girl, who - having fallen pregnant - is faced with the decision to give up her child or run away to start a new life in London. She discovers a newspaper ad asking "Are you lost? Are you afraid...?" It promises the opportunity to board and work in London's most talked about toy store, propriety of Papa John: a former Russian who has brought his talents to entertain and seduce a plethora of eager children and their families. The toy store quickly becomes Kathy's safe haven, a place of wonder and security among friends who become more like family. From the mysterious Wendy house, whose external appearance belies the true internal size, to the "castle in the sky", around which fluffy white clouds gather, and the toyboxes which contain worlds, the magic of this book is wrapped in realism, spinning a tale of historical events which precedes the first World War and continues for many years following. Throughout, toy soldiers provide both metaphor and expression of war-ravaged soldiers in battle. It is both haunting and heart-breaking, well-suited to older and adult readers who retain the awe of a child's discovery and wonder. 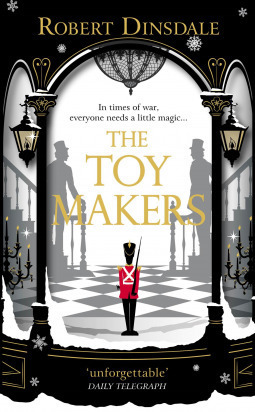 I heartily recommend The Toymakers, particularly the exquisite hardback edition (a beautifully designed cover which would make a wonderful gift), and encourage everyone to read it who would enjoy a magical, literary escape. This was my second time attending an event at this place, and was my first business event here (the other event was a charity show). Everything at the event venues was perfect, the drinks and food was amazing. Even the coffee was wonderful.